Cardiff, the capital of Wales, is often an overlooked city on a visit to the UK, frequently overshadowed by more popular options like London and Edinburgh. But you won't regret adding this Welsh destination to your itinerary—the city is home to several museums, castles in and around the city center, the beautiful Cardiff Bay, and more. Visitors to Cardiff Castle, in the center of the city, could be forgiven for thinking this is a Neo-Gothic fantasy from the Victorian era. Many of the rooms were decorated in that style. In fact, the castle's foundations are probably 2,000 years old. It stands on the site of a Roman fortress that may date to the time of the Emperor Nero. The Normans took advantage of this strategic site to build a castle in 1091. Since then, it has been occupied by different noble families, each of whom added to its comfort and grandeur. But it was Victorian-era, 3rd Marquess of Bute, who spent his apparently unlimited fortune creating the incredible fantasy residence you can visit today. Take a 50-minute house tour through incredibly opulent rooms, including the astonishing Arabian Room pictured here, or take a free audio tour. The Norman keep is the best preserved in the UK and you can visit the underground WWII shelters where hundreds lived and worked in the 1940s. This is a fascinating place with a tremendous amount to see and do. Bute Park used to be once the landscaped grounds surrounding Cardiff Castle. The beautiful riverside park in the heart of the city was designed by legendary landscape architect gardener Lancelot Capability Brown. There's well established woodland walks, an arboretum, Victorian gardens and a cafe — all in a peaceful, 130 acre green oasis. It's named for the Bute family, last private owners of Cardiff Castle, who developed the port of Cardiff, turning it — at one time — into the most important coal shipping port in the world. 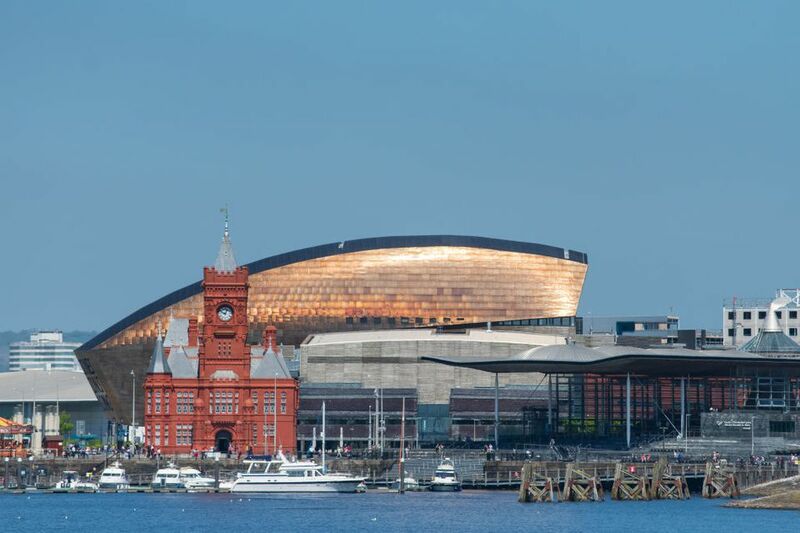 The Wales Millennium Centre, in the Cardiff Bay waterfront area, is the National Arts Centre for Wales. It hosts eight resident companies including the Welsh National Opera, the BBC Orchestra and Chorus of Wales, a dance company and a touring theater company. All its programs are bilingual, in Welsh and English and the center is committed to the preservation of Welsh language and culture — so if you would like to hear this magical language spoken, book a Welsh language performance here. Don't worry, if you don't speak Welsh though. This center hosts concerts, musical theater, touring international performances, cabaret, even stand-up comedy. Visitors often think the striking words on the front of the building, by Welsh Writer Gwyneth Lewis, are English and Welsh translations of the same phrase. But in fact, they are completely different and complementary. The English, "In these stones horizons sing" is paired with the Welsh "Creu Gwir fel Gwydr o Ffwrnais Awen" which means "Creating truth like glass from inspiration's furnace." Ask locals for directions to the Principality Stadium and they might refer to it as the Millennium Stadium. Confusingly, the home of Welsh Rugby was renamed temporarily in a ten year sponsorship deal with a local bank. Never mind — if you are curious about Rugby, what the game is all about and how Rugby Union differs from Rugby League, this is the best place to go because the Welsh are Rugby mad. In the off season you can take a stadium tour or see other events, such as motorsports like MonsterJam. Mermaid Quay is one of the main restaurant, bar and shopping areas on Cardiff Bay. There are dozens of cafes to choose from and a lively street scene. The Senedd, home of the Welsh Assembly, with its dramatic sloping canopy roof adjoins the quay. It is possible to tour the building to to attend art exhibitions and events there. Check their website for a month by month schedule of what's happening..
St Fagans was the UK's first national open air museum. Today it remains one of the most popular attractions in Wales. Visit to learn about the social and cultural history of Wales — costumes and national dress, farm life, crafts and skills, fossils and folklore. It's a great family attraction with outdoor activities — such as a high rope walk — for livelier children. It's open every day including Bank Holiday Mondays, you can bring the family dog along and it's free. Children under 16 must be accompanied by an adult. The fabulously wealthy Victorian, the 3rd Marquess of Bute, was at it again, using his unlimited wealth to create a country retreat to match his other home, Cardiff Castle. Castell Coch is about 5 miles from the city center but easily reached via the 132 bus and about 20 minutes of walking. It is an example of what a lot of money, completely extravagant taste and the Victorian love of the Middle Ages can achieve. Eccentric English architect and designer William Burges, who had a kind of utopian vision of Medieval Britain, was given free rein and an unlimited budget to build the "Red Castle." Work on realizing his plans was continued by his followers for 10 years after his death. His fantastic architectural drawings and design are on display in the house, along with elaborate ceilings and opulent furniture. 500 years of European and Welsh art treasures may seem like an odd partner to galleries full of dinosaur fossils, giant skeletons and other natural history speciments but the combination makes this museum a great choice for families. To make the experience even better for visitors young and old, Museum ExploreAR augmented reality animation handsets are available to rent. Visitors can choose several different programs all based on the museum's collections. These include Monet's Waterlily Garden Experience, Underwater Life Experience in the Marine Galleries and Dinosaur and Prehistoric Creatures Experience. The museum, located in the civic center of the city, is open Tuesday to Sunday and Bank Holiday Mondays. Cardiff's Cathedral, known as Llandaff Cathedral, was badly damaged by the explosion of a German landmine during 1941 Cardiff Blitz of WWII. Despite this and other major upheavals during the Victorian period, the Cathedral still retains much of its original stonework. You can tell its origins as a Norman building dating from about 1120. Even earlier features date back to the 6th century. Visit to see the cathedral's great art treasures. The Rossetti Triptych, "The Seed of David," was completed by the great Pre-Raphaelite artist Dante Gabriel Rossetti between 1855 and 1864. The Epstein Majestas, by British sculptor Jacob Epstein, is a monumental figure of Christ, cast in aluminium, and suspended from an arch in the center of the nave. The original sculpture from which this figure was cast was sent to the Riverside Church in New York City, where it can still be seen today. Another family friendly attraction, Techniquest is a hands one science activity and discovery center. Experiences designed to engage both children and adults are organized around a changing series of themes. In 2019, those themes were Space Hunters, Mars and Fire and Ice. The center is open every day during school holidays and closed on Monday when local schools are in session. Events change all the time so visit the website for the calendar of activities. There's not much you can't buy in Cardiff Market. There's been market trading on this spot since the 1700s, though the huge glass and cast iron canopy that shelters hundreds of stalls and thousands of shoppers dates from the mid-Victorian period. Buy food, shoes, clothing, household gadgets, pots and pans, toys, books, musical instruments — if there's something you need you'll likely find it here. And if you are just passing through, it's fun to browse and engage in some banter with the market traders. The Market is open Monday to Saturday, 8 a.m. to 5 p.m. Sometimes called the Central Market, it's in the city center with entrances on St. Mary Street and Trinity Street. Visit Cardiff, the city's official tourism organization, lists some terrific tours. Walking tours are great ways to see and learn a lot in a short time with insider knowledge coming from entertaining locals. Take beer tours and pub crawls, Halloween haunting tours, foodie tours and history and heritage tours. Check their website to see what's on offer with a regularly changing schedule of walks and tours. Or, if you are really adventurous, why not get an overview of Cardiff and Cardiff Bay from a helicopter. Visit Cardiff offers experience vouchers for flights with Hover Helicopters from Cardiff Heliport. They range from 5 minute flights across Cardiff Bay and 15 minute flights over the city to full on, 30 minute flights up the coast toward Tintern Abbey with bird's eye views from 1,500 feet.